It has been some years since I put together collection of around 500 of Professor F.F Bruce’s articles. I will be revisiting this project this year in an attempt to locate and upload some more of the missing material. These two articles are the firstfruits of this renewed effort. Thanks to F.F. Bruce Copyright International for their kind permission to place them on-line. F.F. Bruce, “Scripture and Tradition in the New Testament,” F.F. Bruce & E. Gordon Rupp, eds., Holy Book and Holy Tradition. International Colluqium held in the Faculty of Theology of the University of Manchester, 1966. Manchester: Manchester University Press, 1968. Hbk ISBN: 0719003032. pp. 68-93. F.F. Bruce, “Salvation History in the New Testament,” E.J. Sharpe & J.R. Hinnells, eds., Man and His Salvation: Essays in Memory of S.G.F. Brandon. Manchester: Manchester University Press, 1973. pp.75-90. Thanks to the kind permission of the copyright holder, Dr. David T. Runia, the following monograph on the importance of creeds is now available on-line in PDF. 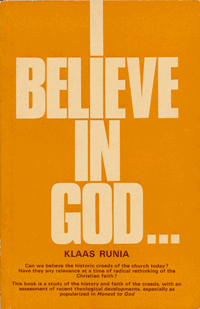 Klaas Runia, I Believe in God…, 2nd edn. London: The Tyndale Press, 1968. Pbk. pp.71. This book had its origin in a series of lectures given to a group of university students. During question time one of them asked: Isn’t it rather silly for Christians to recite the Creeds so often in their worship services? Are Church people really so stupid that they need such repetitions every week? And if there is a God, must He not get sick of all these mechanical recitations? These questions reveal something of the depths of misunderstanding that surround the Church in our day. Many people clearly find it almost impossible to enter into the spiritual atmosphere of the Church. When they hear the word ‘ Creed ‘,they immediately think of intellectual narrowness of closed minds, of lack of scientific liberty, etc. That a Creed may have quite a different function, that it may be a confession of love on the side of the Church, a song of praise and dedication offered to God, simply does not enter into their mind. And yet such it is. In the Creeds Christian believers openly confess that they love God, because of what He is in Himself and because of what He has done in His works of creation and redemption. On the other hand there are those within the Church who, although they may accept the Creeds as venerable documents, reserve for themselves the right to reinterpret them. Such will still maintain that they can subscribe quite sincerely to the Creeds and Confessions of their own denomination. But the theology which underlies their writing and their preaching seems far removed from what has come to be regarded as Christian orthodoxy. They read back into the old formulas their own mid twentieth-century theological ideas. All this suggests that some brief study of the history and faith of the Creeds is called for, together with some assessment of recent theological trends. In attempting this latter task special attention has been paid to what has been called the New Liberalism represented by the writings of Rudolf Bultmann and Paul Tillich and by those, such as J. A. T. Robinson, who have done much to popularize their views.